Ty Bollinger’s documentary series “The Truth About Cancer” demonizes conventional oncology and promotes alternative cancer treatments. I recently wrote an article for Science-Based Medicine pointing out how very untruthful it is. I showed that it used unreliable sources and was full of lies, distortions, omissions, false claims, myths, fallacies, and frankly dangerous misinformation. 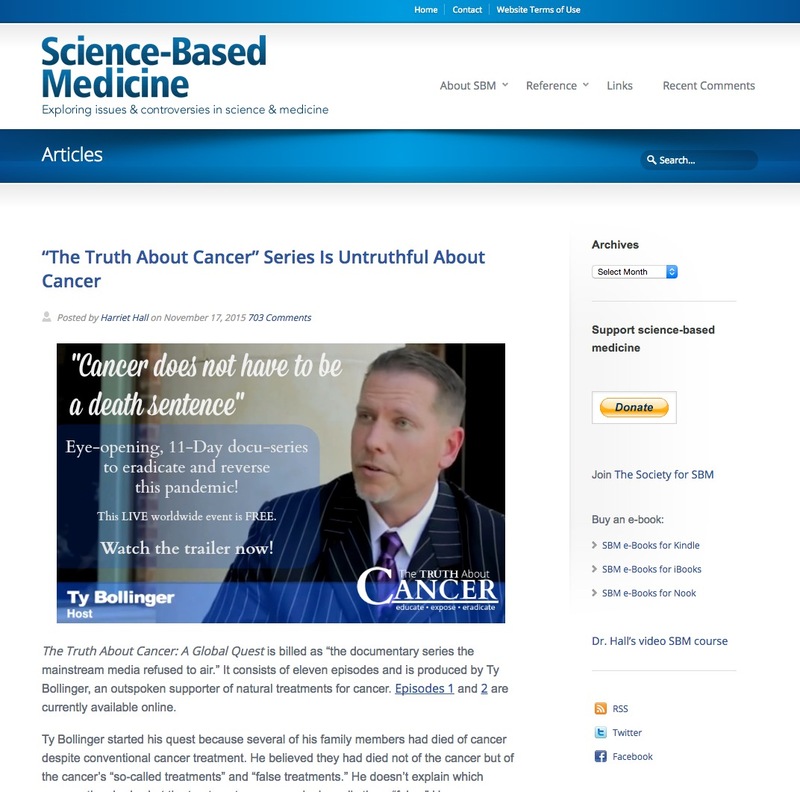 The “Truth About Cancer” series has been not only well received but hyped by critics of conventional medicine and advocates of alternative medicine. Some of them were angry about what I wrote. Instead of commenting in the comments section of the SBM blog, some of the angriest people prefer to attack me via email where others can’t see and debunk their criticisms. Some of the emails I get are doozies. I’ll quote this prize example in its entirely for your delectation. I won’t identify the writer; I want to spare him the embarrassment. The only thing that doctors are taught in medical school is how to prescribe drugs. Professors are being paid by drug companies. The Flexner Report, which reformed medical education in America, was a plot by Rockefeller and Carnegie to create a medical monopoly and eliminate all competition so they could sell more drugs. The medical profession is a lap dog of the pharmaceutical industry. Conventional medical has a monopoly on treatment: they make sure that insurance doesn’t cover CAM. The number one goal of health care is to make money. Saying they are making progress in any disease is only a propaganda war. Business thrives on the continuation of existing diseases. By 2020 more than half of cancers will be medically induced by drugs or radiation. Nobody dies from the cancer, they die from consequences of the treatment. Surgery spills cancer cells, radiation enhances them. get off your prescription drugs and wake up. If there were any errors in what I wrote, he could have politely pointed them out and provided evidence, preferably in the form of citations of scientific studies. Instead, he cut and pasted a bullet list from my article. I had listed these false claims from the documentaries after explaining that they were claims that could easily be refuted by a little research or even common sense. He said these claims were all true, but he didn’t provide a shred of evidence that any of them were true. Can he possibly imagine that his simply saying they are true would be enough to outweigh everything else I know? Sure, I’m going to throw science, evidence, and common sense out the window and just believe some stranger who writes an email! He didn’t address any of the rest of my article and didn’t provide any evidence in support of anything in the documentaries. Then he proceeded to insult me and call me names. Is there any evidence that would prove those claims true? I don’t think so. A moment’s reflection is enough to refute most of them. The others are easily refuted by a little Googling. “How to prescribe drugs” is obviously not the only thing taught in medical schools. Medical school lasts four long years and covers everything from anatomy and physiology to biochemistry and genetics; there is only one course on pharmacology. Professors are not paid by drug companies; they get a salary from the medical school. Some professors may get additional income from ties with drug companies, but they are in the minority. And drug companies don’t determine the curriculum. How can you say conventional medicine excludes “anything coming from nature” when half of all prescription drugs were developed from plants? The medical profession is hardly the “lap dog” of the pharmaceutical industry. Where did that idea even come from? If that were true, why would doctors identify post-marketing problems with drugs and get them taken off the market? Why would doctors stop prescribing drugs that were found to be ineffective? Wouldn’t they just slavishly prescribe whatever their overlords told them to prescribe? Just one disconfirming example: look at the decrease in prescribing hormone replacement for menopausal women after studies showed it did more harm than good. If doctors were lapdogs, the studies would not have been done and the prescription rate would not have dropped. Insurance does cover various forms of CAM, including acupuncture, chiropractic, and visits to so-called “integrative medicine” doctors. Doctors are not the ones who determine what is covered. Coverage is driven more by patient demand and business interests than by scientific rigor. The number one goal of health care is not to make money; it is to provide health care. Alternative medicine is not free; it might just as well be argued that their number one goal is to make money. It is impossible to deny that progress is being made in the treatment of cancer. The cancer death rate has dropped 20 percent since the early 1990s. Today, two out of three patients live at least five years after a cancer diagnosis, compared to one out of two in the early 1970s. Some cancers can be permanently cured with today’s conventional treatments, especially childhood cancers. Progress is slow but steady. And there has been no comparable progress in alternative cancer treatments. It is hard to believe that anyone would be so evil as to want diseases like cancer to persist. Doctors and pharmaceutical employees get cancer too, and have family members who get cancer. If there were any effective alternative cancer cures, they would be quick to adopt them. “By 2020 more than half of cancers will be medically induced by drugs or radiation.” Nonsense! They just made that up. “Nobody dies from cancer they die from consequences of the treatment.” WHAAAT??!! How could anyone believe that? Read a history book! Look at Egyptian mummies. Cancer kills. Ty Bollinger is advocating cancer treatments (alternative ones) precisely because he knows people die from untreated cancer. Conventional treatments have side effects, but there is plenty of evidence that treatment helps most patients. Drugs have to prove that they work before they can be marketed. If chemotherapy drugs killed more patients than they helped, they could never have been approved by the FDA. “Surgery spills cancer cells”? No, well-conducted operations are no more likely to produce metastases than the squeezing or jostling from common activities. “Radiation enhances them”? No, exactly the opposite: radiation destroys cancer cells. There are plenty of integrative oncologists in California, as anyone can easily verify with a couple of mouse clicks. There’s no law against it. Where on Earth did they get that idea? I actually find it flattering when someone attacks me so stupidly. It means what I wrote was so accurate that they were unable to find anything they could legitimately criticize. Personal insults are the last resort of the intellectually bankrupt. Why do people believe claims like these? Ignorance, gullibility, lack of science education, susceptibility to testimonials, and peer pressure might explain belief in some of these claims. But some of these claims are so obviously false that it takes willful obtuseness and disregard of reality to believe them. Perhaps they have emulated the White Queen in Lewis Carroll’s Through the Looking Glass and have practiced believing six impossible things before breakfast. The sad thing is that people who believe the misinformation in Bollinger’s “Truth About Cancer” series will be persuaded to forgo lifesaving cancer treatment in favor of false hopes. The alternative practitioners he interviews are taking advantage of suffering patients at their most vulnerable, when they are ready to believe anyone who promises a cure, no matter how nonsensical the treatment. This is a serious concern: people will die. Bollinger and his cohorts will have blood on their hands.